Late last year Mozilla launched a private browser for iOS called Firefox Focus. Now the browser arrives on Android bringing the same privacy-focused internet experience to users of Google's mobile operating system. When Mozilla talks about being privacy-focused, it does not just mean using Private Browsing. 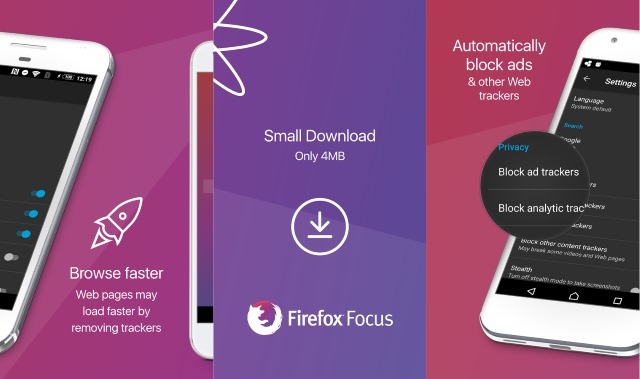 Firefox Focus is a completely separate browser which blocks trackers, analytics and ads, and also wipes your browsing history with a single tap. As well as improving privacy, Focus also speeds up web browsing and reduces data usage. Mozilla describes Focus as offering "next-level privacy" and for the curious-minded it provides a live counter that shows how many ads have been blocked on a site. The tracker and analytics blocking helps to cut down on unwanted intrusions, but there is the option of temporarily disabling it if the feature breaks a site. For Android users we also made Focus a great default browser experience. Since we support both custom tabs and the ability to disable the ad blocking as needed, it works great with apps like Facebook when you just want to read an article without being tracked. We built Focus to empower you on the mobile web, and we will continue to introduce new features that make our products even better. The browser has a very sparse look and there's a notification system in place that reminds you to erase your browsing activity if you leave Focus running in the background. You can download Firefox Focus free of charge from Google Play.